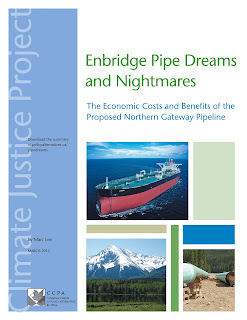 A new study reviews the economic case for the Enbridge Northern Gateway Pipeline (NGP) and casts serious doubt on claims that the pipeline will lead to substantial job creation and other economic benefits. Enbridge claims that the NGP will create 63,000 person years of employment during the construction of the pipeline, and 1,146 full-time jobs once it’s completed. “That sounds like a lot of employment, until you start breaking down the numbers,” says Marc Lee, senior economist at the Canadian Centre for Policy Alternatives’ BC Office, and author of Enbridge Pipe Dreams and Nightmares: The Economic Costs and Benefits of the Proposed Northern Gateway Pipeline. The study finds that Enbridge’s job creation estimates are based on flawed modeling and questionable assumptions. Estimates assume that workers would otherwise be unemployed, and a large share of the estimated jobs come from induced employment, i.e. the economic impact of expenditures by Enbridge workers and governments. These “induced” impacts are particularly difficult to estimate and notoriously easy to overstate. The ecological crisis is deepening. 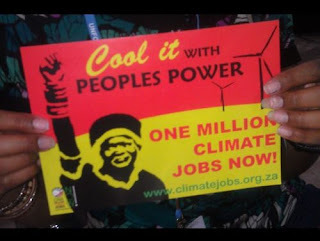 Despite 17 years of negotiations there is no binding global agreement on the reduction of carbon emissions and such an agreement is unlikely to emerge from COP 17 in Durban in December. In fact carbon emissions are rising which means climate change will intensify and have devastating impacts – particularly on the working class – in the form of rising food prices, water shortages, crop failures and so on. Africa will be the worst affected. So what is to be done? 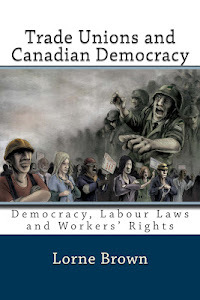 According to Sean Sweeney: ‘In recent years global labor has worked on the premise that the ‘real world’ historical options are essentially two-fold. 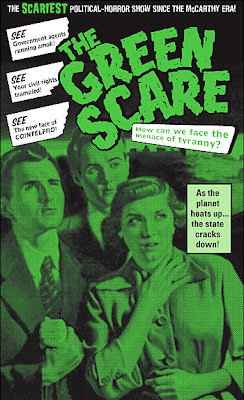 Either humanity will transition to some form of “green capitalism” where economic growth is delinked from emissions and environmental destruction generally, or we face a “suicide capitalism” scenario where fossil-fuel corporations and major industry, agriculture, transport and retail interests are successful in maintaining business as usual’ (Sweeney 2011: 9). Hythe, Alberta — It’s not if, but when. Eco-warrior Wiebo Ludwig is preparing for death. With his weight now under 150 pounds, he predicts he’ll be gone in just weeks, a victim of cancer of the esophagus. Ludwig has battled the disease for the past year. The Dutch-born patriarch of a Christian clan “living off the land” in Alberta’s Peace River country is in palliative care. 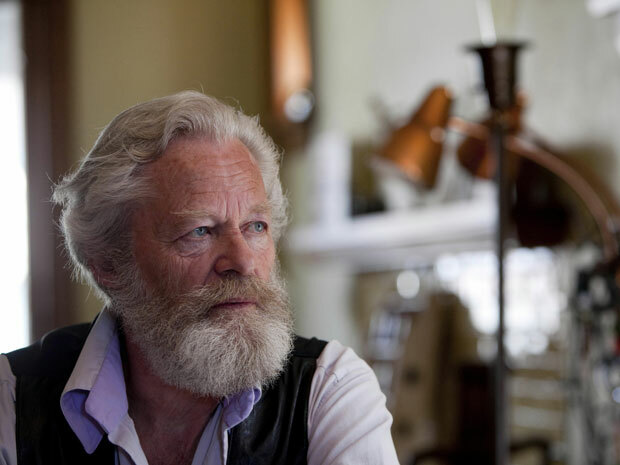 Ludwig, who turned 70 in December, takes pain medication to get through the night. “I’m trying to stay off pain killers as much as possible,” he reveals. To reduce their father’s pain, Charity, Salome and Mamie ‘Junior’ apply medical herbs wrapped in heated cloths to his chest and legs, now noticeably thin. French Left Front: "There Is A Good Common To All of Humanity"
Jean-Luc Melenchon, the Left Front candidate in the presidential election, received us at his headquarters in les Lilas , to share with us his political project. As his campaign is taking off, he took the opportunity provided by our meeting to send to the youth a message of optimism. Huma: Why don’t you devote more time to ecology in your campaign? 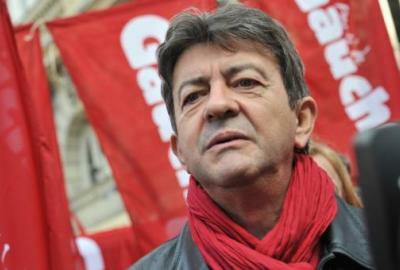 Jean-Luc Mélenchon: Ecology occupies a place for us that it has never found in any program of the traditional left. 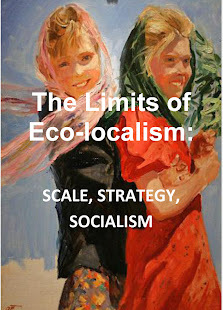 Check: the economic program of the Left Front is built around the concept of ecological planning. There is an intuition of communism which is verified by political ecology, namely that there is a common good of humanity. If we consider only what is good for us, we will include corporatisms, but if we think about what is good for everyone, we will have a chance to get hold of an effective solution. This is what lies at the foundation of the Republic: the common good, that which is good for all. 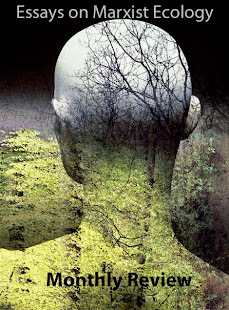 So political ecology is the reforming paradigm of communism, of socialism, and of humanist universalism. 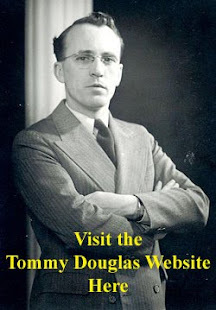 We carry its ideas because we are the voice of the social class which, by its material conditions of existence, has no particular interest other than the public interest. You don’t want to give too much credence to the unhinged accusations of crotchety Conservative senators, but their recent attacks on environmentalists suggest a bold escalation in the government’s anti-green messaging. Senator Don Plett, a former Conservative party president, picked up on a flippant remark from one environmentalist who said he would accept money “from Martians” if it helped preserve B.C.’s pristine coast. 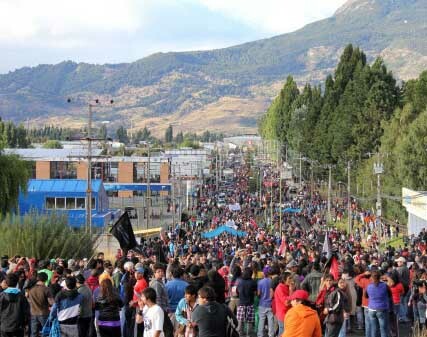 A new report reveals the Canadian mining industrial complex's responsibility for social discord and environmentally-destructive policies in Chile's Patagonia region. “Far away, on the southern cone of South America in Chilean Patagonia, exists one of the most beautiful, still-virgin territories on Earth. 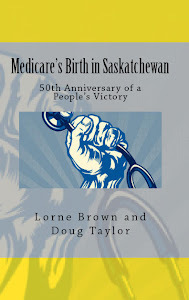 There, an intense struggle is taking place that most Canadians have never heard of, but that intimately involves the Canadian mining industry, the Canadian government, and millions of Canadian pensioners and investors,” notes Council of Canadianschairperson Maude Barlow in the report's introduction. The report, Chilean Patagonia in the Balance: Dams, Mines and the Canadian Connection, asserts that Canada's mining industry, which leads the world in mining investment with more than half of its assets in Latin America, accounts for 33 percent of electricity demand in Chile while advantageously exercising enormous influence in setting government policy there. Water grabbing refers to situations where powerful actors are able to take control of or divert valuable water resources and watersheds for their own benefit, depriving local communities whose livelihoods often depend on these resources and ecosystems. The ability to take control of such resources is linked to processes of privatisation, commodification and take-over of commonly-owned resources. They transform water from a resource openly available to all into a private good whose access must be negotiated and is often based on the ability to pay. Water grabbing thus appears in many different forms, ranging from the extraction of water for largescale food and fuel crop monocultures, to the damming of rivers for hydroelectricity, to the corporate takeover of public water resources. 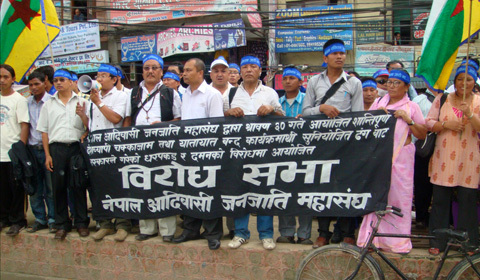 It also inheres in a model of development which is underwritten by a trade in virtual water. Water grabbing is not a new phenomenon and has much in common with earlier resource grabs and what has been called the “enclosures of the commons.” The new dimension of contemporary water grabbing is that the mechanisms for appropriating and converting water resources into private goods are much more advanced and increasingly globalised, subject to international laws on foreign investment and trade. There is thus a real concern that a new generation of ‘Mulhollands’, the early 20th Century Los Angeles official who made water grabbing infamous, will profit from this scenario to the detriment of local communities and ecosystems, and at a scale that has not been seen before. 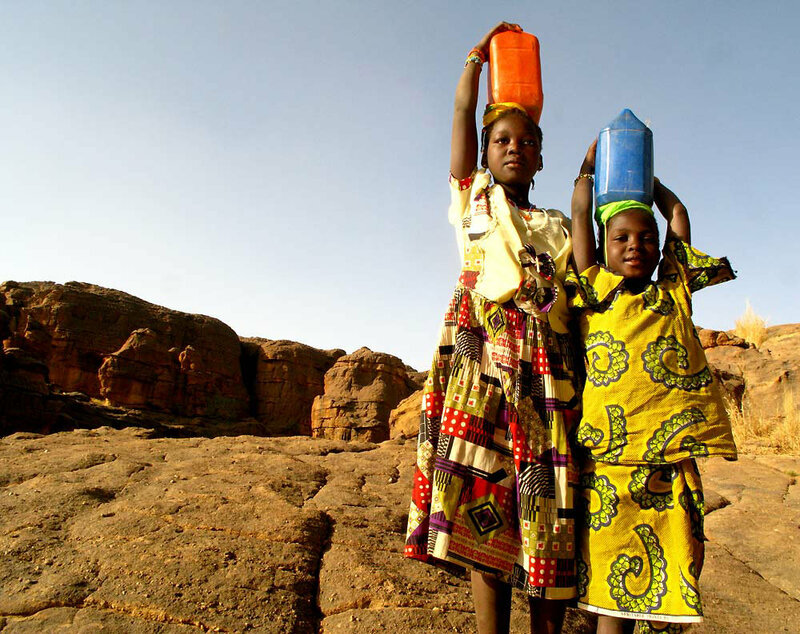 In the context of a ‘global water crisis’, where 700 million people in 43 countries live below the water-stress threshold of 1,700 cubic metres per person, there is an urgent need to put an end to the global water grab. A new study finds the tar sands have yet higher CO2 emissions than expected because of the threat they post to forests and peatlands. That is no bombshell: Climate Progress has previously pointed out that tar sands development threatens the carbon-rich boreal forests. Now it has been quantified. 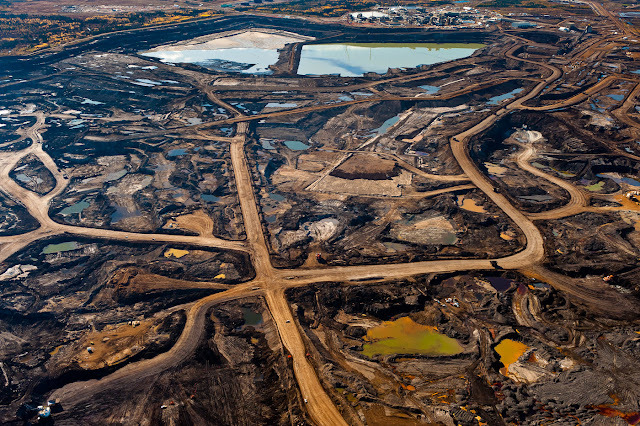 A new study in the Proceedings of the National Academy of Sciences finds that existing industry plans for exploiting the tar sands will destroy over 29,500 hectares (65%) of local peatland. Peatlands are better known as bogs, moors, mires, and swamp forests. Their decaying organic matter is rich in carbon and already emerging as a major amplifying carbon-cycle feedback. New and Recent Features is what a print newspaper would call “above the fold.” It displays our current top stories and essays. All Articles is exactly what it says. A chronological list of recent additions, with links to pages showing every C&C article, listed by date or by topic. The Center Section displays various groups of articles. The display will change from time to time. 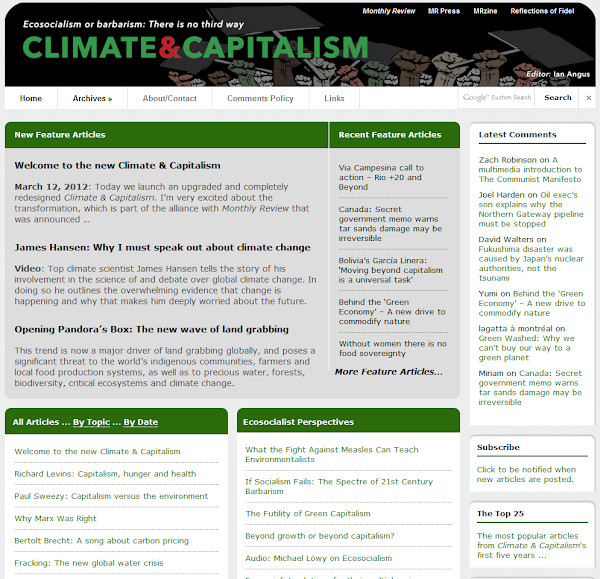 For example, this section might display articles about a major event like the Cochabamba conference, or articles on a specific subject like Ecosocialist Perspectives. 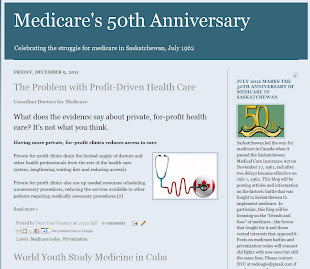 The Sidebar, on the right, starts with recent reader comments on C&C articles. C&C encourages constructive discussion and debate, and we hope you’ll continue to make full use of this feature. Below the comments, you’ll find a variety of useful (we hope!) links. And we’ve only just begun! We’re now sharing MR’s web servers, which give us more capacity than ever. And our powerful new “back end” will allow us to add new features and options in coming months. This transformation would not have been possible without MR’s webmaster, Jamil Jonna. With great technical skill and endless patience, he converted our vague design ideas into a website that exceeded our expectations by a huge margin. He also managed the faultless transfer of more than five years of content from the old site to this. We simply could not have made this change without him. 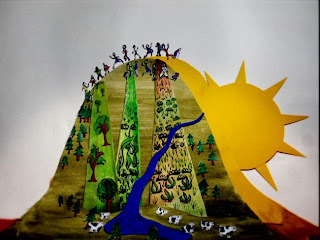 Video by the Nepal Federation of Indigenous Nationalities in partnership with Tebtebba, IWGIA and AIPP concerning climate change and the REDD partnership program in Nepal. WASHINGTON (AP) — Unions may be united in working to re-elect President Barack Obama, but their leaders also are trying to repair bitter divisions over his rejection of an oil pipeline from Canada to Texas. Trade unions representing workers who stand to benefit from thousands of new construction jobs from the Keystone XL pipeline are furious at other unions that joined environmentalists in opposing the project. 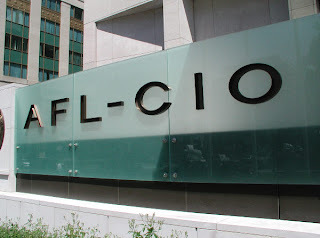 AFL-CIO leaders hope to smooth tensions at their executive council's annual winter meeting that starts Monday in Orlando, Fla.
"Our mission at rise up films is simple - To create the best archive of freely available, provocative, informative and inspirational documentaries anywhere on the web." With its muddy roads, humble huts, and constant military patrols, Bajo Aguán, Honduras feels a long way away from the slick polish of the recurring UN climate negotiations in the world’s capital cities. Yet the bloody struggle going on there strikes at the heart of global climate politics, illustrating how market schemes designed to “offset” carbon emissions play out when they encounter the complicated reality on the ground. 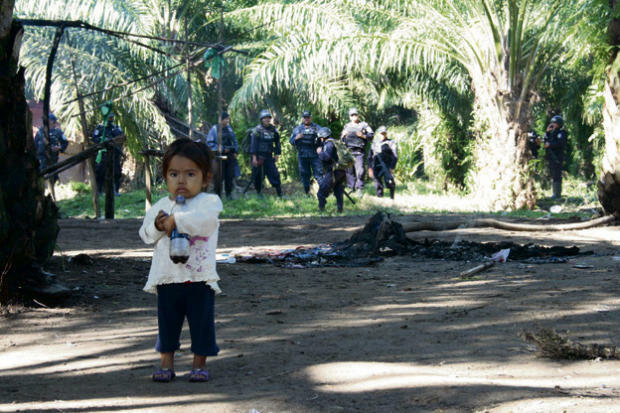 Small farmers in this region have increasingly fallen under the thumb of large landholders like palm oil magnate Miguel Facussé, who has been accused by human rights groups of responsibility for the murder of numerous campesinos in Bajo Aguán since the 2009 coup. 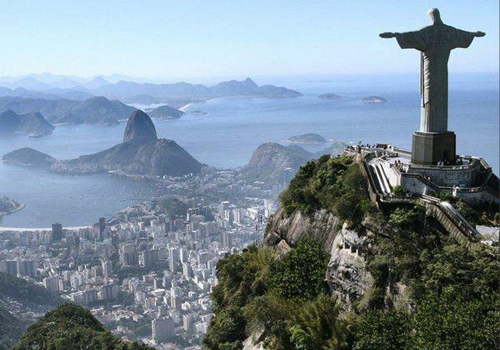 Yet Facussé’s company has been approved to receive international funds for carbon mitigation under the UN’s Clean Development Mechanism (CDM). The contrast between the promise of “clean development” and this violent reality has made Bajo Aguán the subject of growing international attention — and a lightning rod for criticism of the CDM. 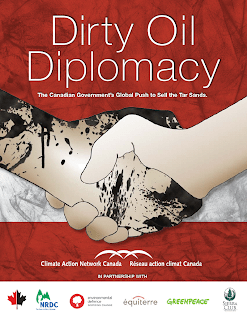 Climate Action Network Canada, in partnership with the NRDC, Environmental Defence, Equiterre, Greenpeace and Sierra Club, launched a new report today – Dirty Oil Diplomacy, The Canadian Government’s Global Push to Sell the Tar Sands. 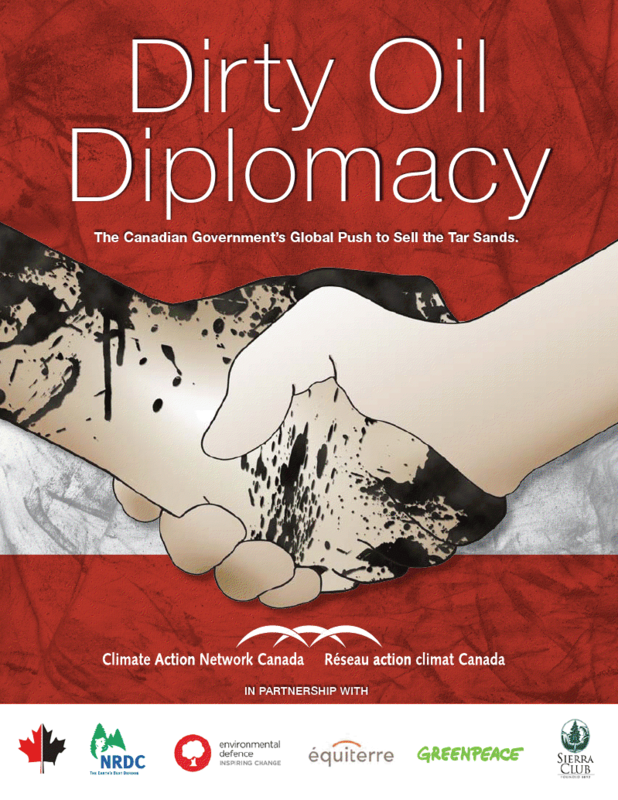 I just returned from a breakfast briefing with diplomats here in Ottawa introducing the report which provides hard-hitting evidence of our government’s strategy to promote the tar sands and undermine climate legislation in Europe and the U.S. Yesterday, in the lead up to the launch of this report, candle light vigils were held outside Canadian missions in more than 20 locations in the U.S. and Canada to voice concern and extend hope that Canada will reverse its international lobbying on behalf of highly destructive and polluting tar sands oil industry. You can see pictures here. 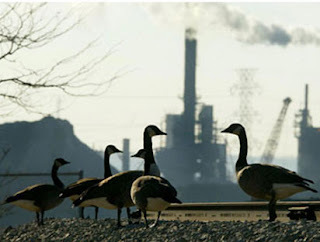 The report, which you can download here begins with providing a brief ‘101’ on tar sands and the context of domestic Canadian policy which includes the federal government’s track record of failed climate change legislation policy, declining support for climate science, oil and gas sector subsidies and attacks on First Nations and environmental groups. 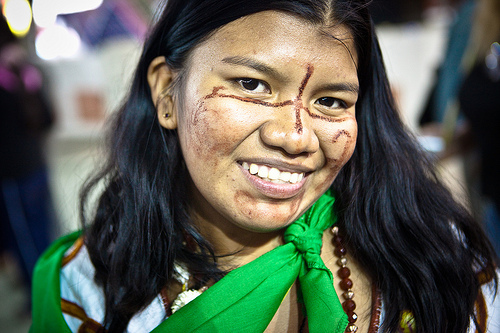 A thematic Social Forum focused on "Capitalist Crises, Environmental and Social Justice" was held from January 24-29, 2012 in Porto Alegre, Brazil. The dominant theme of the Forum was the upcoming Rio+20, the UN Conference on Sustainable Development taking place this June in Rio de Janeiro, 20 years after the famous 1992 UN environmental conference held in the same location. The great sociologist Boaventura de Sousa Santos has written a thoughtful report on the Porto Alegre event. 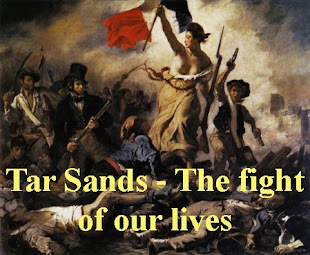 Santos notes that social movements focused on the challenges that the current form of globalization poses: climate change, water shortages, salinization, desertification, the devolving quality of food, the privatization of biodiversity and modern society's perpetual inability to control technology. As well, activists presented proposals that could replenish nature: food sovereignty, responsible consumption, the defence of humanity's common goods, non-Eurocentric forms of knowledge, ecological democracy and the move from an anthropocentric civilization to a bio-centric one. 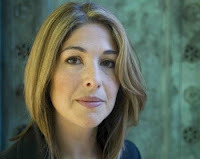 The genius of the social forum space is that it facilitates a global alliance of progressives by encouraging the articulation of common frames of understanding across diverse, often divided, movements such as environmentalists and leftists. March 8th is International Women’s Day, a day on which we honour the memory of the many women workers, both rural and urban, who sacrificed their lives in the struggle for their rights, for justice, in order to end all discriminations and the social, economic and political inequalities that are among the underlying aspects of the development of global capitalism. It is also a day for celebrating the important progress that has been achieved in women’s struggles for emancipation. 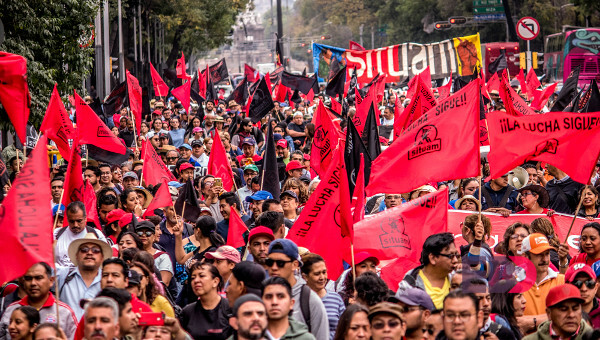 March 8th is also a day of mobilisation and reaffirmation of the unlimited, on-going commitment to the struggle to end the patriarchal, capitalist system that is more oppressive to women in all spheres of society all over the world. This huge struggle continues to drive the urgent reflection of both men and women in La Via Campesina on how to progress, and change to acheive the type of society that we wish to build, with a new balance of power in social relationships where men and women have equal opportunities, rights and duties. If current trends continue, global food crises will become more frequent and more severe. Today's food systems already leave hundreds of millions of people in hunger and are rapidly depleting the soil fertility on which long-term food security depends. Add to this mix the convergence of climate change and peak oil and it's clear we need major changes to the way food is produced and distributed. Growing Change looks at one of the most exciting experiments in the world to turn this around - efforts to grow a more fair and sustainable food system in Venezuela. From fishing villages to cacao plantations to urban gardens, this growing social movement is showing what's possible when people, not corporations, start to take control of food. 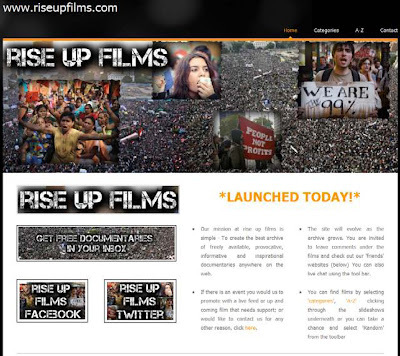 For more info’ about the film, visit HERE. One year have passed since tremendous scale of earthquake and tsunami catastrophe which severely attacked and destroyed towns and villages in North-East coastal region of Japan. Nearly 20,000 people were killed and missing, 341,000 have been evacuated, and many people lived in affected zones lost their fundamental basis of daily existences, such as houses, public transport, health care, jobs, and their communities. Furthermore, the worst nuclear accident of Fukushima Dai-ichi(No1) have caused increasingly devastating situations among population in Fukushima prefecture. The number of evacuee from towns and villages near the Fukushima Dai-ichi nuclear plant is reaching 100,000. They will be not able to return their hometown for several decades, in fact indefinite period, because of radioactive contamination of land, river, sea and air. Whenever North Americans fill up their vehicles with gasoline these days they should reflect on their ongoing contribution to the dysfunctional status of petro states and the Islamic Republic of Iran in particular. Iran's civilian nuclear power ambitions, of course, have set off a grand political tiff with the United States and Israel. Both suspect the nation wants to make atomic weapons too. The United States, which pioneered the globe's oil addiction, has imposed trade sanctions while pundits have begun to beat war drums. Israel, which has quietly eliminated a few Iranian nuclear engineers, has hinted about pre-emptive strikes. 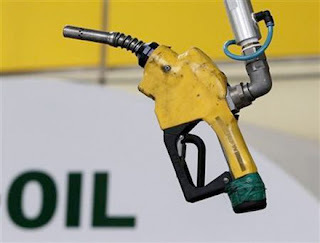 As a consequence, North American motorists, whose driving habits and penchant for cheap oil transformed Iran, Mexico, Nigeria, Venezuela and Saudi Arabia into bona fide petro states decades ago, are now paying a higher price at the pumps for the most volatile of global commodities. SFU geographer Kirsten Zickfeld notes in a new paper she has co-authored that northern hemisphere dwellers will suffer more severe effects of climate change than others. Even if zero emissions of greenhouse gases were to be achieved, the world’s temperature would continue to rise by about a quarter of a degree over a decade. That’s a best-case scenario, according to a paper co-written by a Simon Fraser University researcher. “Let’s be honest, it’s totally unrealistic to believe that we can stop all emissions now,” says Kirsten Zickfeld, an assistant professor of geography at SFU. “Even with aggressive greenhouse gas mitigation, it will be a challenge to keep the projected global rise in temperature under 2 degrees Celsius,” emphasizes Zickfeld. Deep inside the verdant and sweltering vegetation of Nicaragua's Mosquito Coast, a specially trained army unit is waging a new kind of war against a new type of enemy. Operation Green Gold is the inaugural mission of Nicaragua's newly formed Ecological Battalion. It is Central America's first concerted effort to seek a military-backed solution to the threats of climate change. 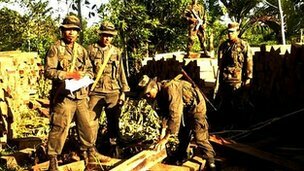 The green guard, a unit of 580 environmental soldiers, recently won its first "battlefield victory" by netting 111,800 cubic feet (3,165 cubic metres) of illegal lumber felled by loggers. 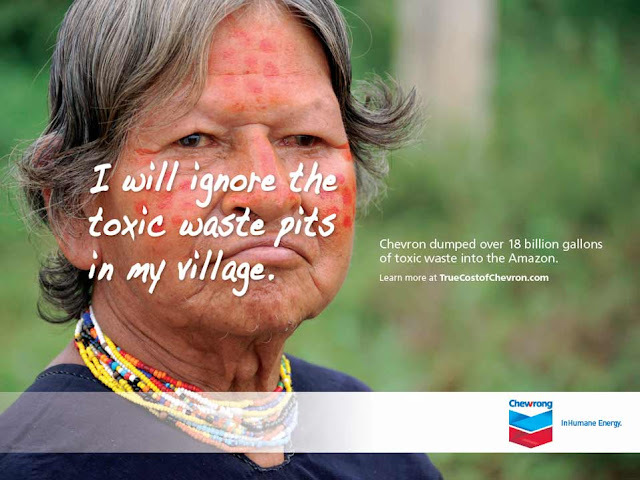 Environmentalists seem to realize that they have some stake in a fight such as the Ecuador-Chevron lawsuit. That case, which Chevron has recently moved to an international arbitration panel in an attempt to avoid a multibillion penalty handed down by Ecuadorian courts, is about whether a multinational oil corporation will have to pay damages for pollution for which it is responsible. Most environmentalists figure that would be a good thing. But what about fights between multinational oil giants and the governments of oil-producing states over control of resources? Do people who care about the environment and climate change have a stake in these battles? It appears that they do, but most have not yet noticed it. Perhaps one of the most well-known voices for the Left, Canadian Naomi Klein is an activist and author of several nonfiction works critical of consumerism and corporate activity, including the best sellers No Logo (2000) and Shock Doctrine (2007). 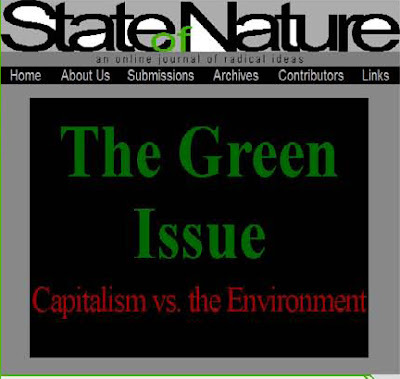 In your cover story for the Nation last year, you say that modern environmentalism successfully advances many of the causes dear to the political Left, including redistribution of wealth, higher and more progressive taxes, and greater government intervention and regulation. Please explain. The piece came out of my interest and my shock at the fact that belief in climate change in the United States has plummeted. If you really drill into the polling data, what you see is that the drop in belief in climate change is really concentrated on the right of the political spectrum. It’s been an extraordinary and unusual shift in belief in a short time. In 2007, 71 percent of Americans believed in climate change and in 2009 only 51 percent believed—and now we’re at 41 percent. So I started researching the denial movement and going to conferences and reading the books, and what’s clear is that, on the right, climate change is seen as a threat to the Right’s worldview, and to the neoliberal economic worldview. It’s seen as a Marxist plot. They accuse climate scientists of being watermelons—green on the outside and red on the inside.